Glaucoma surgery has long relied on ab externo techniques such as augmented trabeculectomy and tube-shunt procedures. While these have excellent potential to lower intraocular pressure (IOP), they are associated with risks, including hypotony, and are therefore conventionally reserved for those with advanced glaucoma or at high risk of visual loss. Traditional filtering surgery attempts to bypass the eye’s physiological outflow pathway, however new minimally invasive glaucoma surgery (MIGS) procedures have recently been introduced that focus on the angle structures as a target for improving aqueous outflow. There are a growing number of ab interno MIGS procedures that utilise the natural drainage pathways of the eye in the management of glaucoma. This article examines the progress so far and describes how the angle has become a viable target for glaucoma surgery. Rhys Davies, Mei-Ling Cheng and Andrew J Tatham have nothing to declare in relation to this article. This study involves a review of the literature and did not involve any studies with human or animal subjects performed by any of the authors. 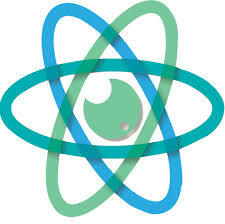 No funding was received for the publication of this article. Despite the importance of the drainage angle in the pathogenesis of glaucoma, until recently the angle has been overlooked as a potential surgical target in adults. Angle procedures such as goniotomy and trabeculotomy have though been the preferred surgical option for children with primary congenital glaucoma (PCG). The reason for the different treatment approach is that there are distinct differences between POAG and PCG, with the latter the result of trabeculodygenesis; perhaps explaining the lack of efficacy of goniotomy in adults compared to children. 4,5 The last decade, has however, seen renewed interest in angle surgery for POAG, with the introduction of several minimally invasive glaucoma surgery (MIGS) procedures specifically targeting the angle. Although these procedures typically have modest IOP reduction compared to trabeculectomy, they have the advantage of being conjunctiva preserving ab interno procedures with high safety profiles and rapid recovery compared to traditional glaucoma surgery. Their good safety profile may lower the threshold for surgery and provide a safer surgical option, more suitable for patients with mild to moderate glaucoma. 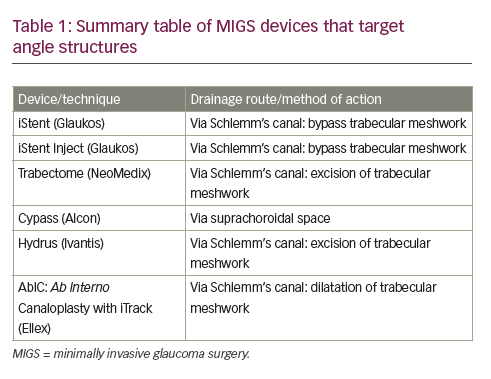 While some MIGS devices target other anterior drainage pathways (such as the Xen ® microstent, Allergan, CA, US), this review presents an overview of MIGS devices targeting the angle, as summarised in Table 1 . 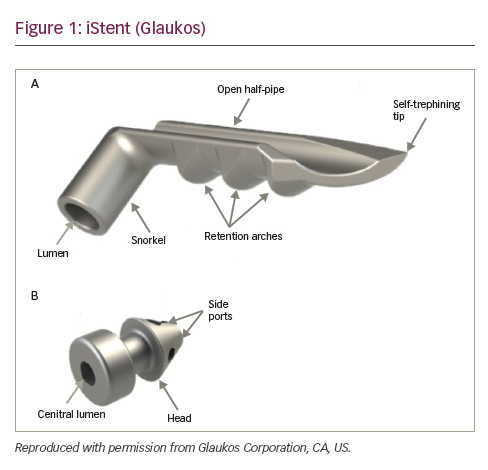 The iStent® Trabecular Micro-Bypass Stent (Glaukos Corporation, CA, US) was introduced in 2007 and approved by the FDA in 2012. It is a 0.3 mm wide, 1 mm long, heparin-coated, titanium, snorkel-like device which can be implanted through a 1.5 mm corneal incision (Figure 1). The device is implanted under gonioscopic guidance by pushing the tip of the stent through the TM into Schlemm’s canal. This allows aqueous humour to drain from the anterior chamber into Schlemm’s canal, bypassing two sites of resistance to aqueous humour outflow; the juxtacanalicular TM and the inner wall of endothelial cells of Schlemm’s canal. However, successful IOP-lowering depends on the integrity of the distal outflow pathways. If the device is placed in a non-functioning section of Schlemm’s canal or if the collector channels or aqueous veins draining this section are compromised, the chances of success are likely reduced. iStent is commonly combined with cataract surgery, so many of the studies examining the safety and efficacy of the device have compared combined cataract and iStent surgery to cataract surgery alone. examined the efficacy of a combined procedure with cataract surgery alone.8 The results showed a mean decrease in IOP of 9% from baseline following combined cataract surgery with one iStent, compared to a 4% drop with cataract surgery alone. Although iStent does not have the same IOP reducing power compared to more invasive procedures, it has a good safety profile and may be considered for patients with mild to moderate disease, particularly those who also require cataract surgery. A second-generation iStent (GTS- 400 iStent inject®; Glaukos Corporation, CA, US) is now available, with two stents housed within the same injector, enabling two implants to be inserted with greater ease. This has potential advantages as there is some evidence that inserting two iStents may offer superior IOP lowering compared to one iStent alone. The iStent meta-analysis found a 27% reduction in IOP with cataract surgery and two iStents compared to a 9% reduction from baseline with cataract surgery and one stent.8 Initial results from a non-randomised, uncontrolled prospective case series of 20 patients, evaluating the efficacy and safety of iStent inject with phacoemulsification were published recently.9 The study showed a 37% reduction in IOP (9.74±3.14 mmHg, p<0.001) and a reduction in drops from 1.3±0.66 to 0.75±0.79 (p=0.017). Trabectome® (NeoMedix Corp, CA, US) was the first of the modern devices for angle surgery, approved by the FDA in 2004. The procedure, which is also often combined with cataract surgery, involves creating a 1.6 mm clear corneal incision to perform electro-ablation of TM. Under direct visualisation through a surgical gonioscope, a bipolar electrode is used to deliver plasma-mediated ablation of TM, which reportedly minimises heat dissipation to surrounding tissues. Schlemm’s canal is effectively de-roofed, therefore, similar to iStent, Trabectome aims to remove resistance to aqueous outflow at the level of the TM and inner wall of Schlemm’s canal. Trabectome is generally contraindicated for neovascular glaucomas, more than moderately active uveitis, angle dysgenesis and corneal oedema where the view of the angle is limited. 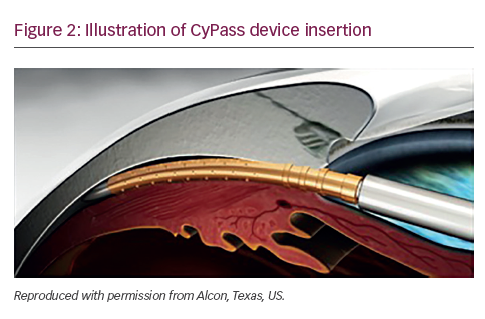 The CyPass® (Alcon, Texas, US) is a minimally invasive ab interno device inserted between the sclera spur and ciliary body, taking advantage of the negative pressure gradient between the suprachoroidal space and the anterior chamber which facilitates drainage of aqueous into the suprachoroidal space. The device is 6.35 mm long, with an external diameter of 510 μm, and designed to be performed during cataract surgery. It received FDA approval in August 2016 (Figure 2). The pivotal study evaluating Cypass was the 2-year COMPASS study, carried out by the CyPass Study Group, which evaluated the safety and efficacy of CyPass in patients also undergoing cataract surgery.12 Five-hundred and five participants were randomised into those having cataract surgery alone (n=131) or those having combined cataract surgery with CyPass (n=374). Subjects had a diagnosis of POAG with mean un-medicated IOP between 21–33 mmHg. The main outcome measures included the percentage of subjects achieving ≥20% unmedicated IOP lowering, mean IOP change and glaucoma medication use at 24 months. Overall, the study showed enhanced IOP-lowering with CyPass compared to cataract surgery alone. On average IOP was reduced by 7.4 mmHg in the CyPass group compared to 5.4 mmHg with cataract surgery alone (p<0.001), with 85% of patients in the CyPass group not requiring glaucoma medications, compared to 59% of controls. Rates of adverse events were similar between groups, with CyPass exhibiting a good safety profile. The HYDRUS II study was a 2-year prospective, single-masked multicentre trial comparing the Hydrus Microstent combined with cataract surgery to cataract surgery alone.14 Results obtained from 78 subjects showed 80% of patients achieved a 20% reduction in IOP with Hydrus plus cataract surgery compared to 46% with cataract surgery alone. Average IOP was also lower in the Hydrus group (16.9±3.3 mmHg compared to 19.2±4.7 mmHg, p=0.009). The proportion of patients who were medication-free at 24-months was higher with Hydrus by a factor of almost 2:1 (72.9% versus 37.8%, p=0.0008), and no serious adverse events were encountered in either group. The Kahook Dual Blade (New World Medical, California, US) is a novel single-use ab interno device that has a pointed tip to pierce the TM, a ramp to lift the tissue above the normal plane of the TM, and two parallel blades to incise the TM and inner wall of Schlemm’s canal, without residual TM or damage to surrounding structure. In cadaver eyes, TM excision with the dual blade was more complete than with the Trabectome;15 however, results from clinical studies are awaited. Traditional canaloplasty requires a partial conjunctival peritomy and scleral flap formation to gain success to Schlemm’s canal. Through this access, a small catheter is inserted and viscoeleastic dilatation of Schlemm’s canal is achieved throughout its full length. However, in order to maintain adequate dilation a tight intraluminal suture is required. This procedure requires conjunctival sacrifice, a sclerostomy, and the risk of Schlemm’s canal recollapse following the procedure. Ab interno canaloplasty is a refined version of the ab externo approach. Through a 1.8 mm clear corneal incision and under gonioscopic vision, access to Schlemms canal is gained using through a small goniotomy. A microcatheter is then advanced the full length of Schlemm’s canal, under transscleral visualisation provided from the illuminated catheter tip. Once fully accessed Schlemm’s canal is viscodilated, which not only dilates the canal but also the collector channels.16 Whilst the manufacturers highlight the ab interno approach is as effective as traditional canaloplasty, at present, there are few published studies available. The angle has had somewhat of resurgence as a target for glaucoma surgery, and now offers itself as a viable site for safe, minimally invasive ab interno techniques. While trabeculectomy and conventional tube surgery offer a superior pressure-lowering profile, they also carry greater risk of complications, meaning they tend to be reserved for patients who have exhausted other treatment options or have advanced disease. MIGS devices can be offered earlier in the course of disease, reducing the burden of medications, and perhaps delaying or avoiding the need for conventional glaucoma surgery. The renewed interest in minimally invasive surgical techniques targeting the angle has become an exciting and dynamic area of surgical progress in glaucoma. 1. 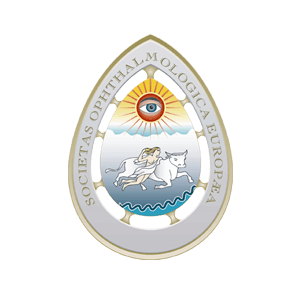 Razeghinejad MR, Spaeth GL, A history of the surgical management of glaucoma, Optom Vis Sci, 2011;88:E39–47. 2. Gedde S, Herndon LW, Brandt JD, et al., Postoperative complications in the tube versus trabeculectomy (TVT) study during five years of follow-up, Am J Ophthalmol, 2012;153:804–14. 3. Kirwan JF, Lockwood AJ, Shah P, et al, Trabeculecomty in the 21st century: a multicenter analysis, Ophthalmology, 2013;120:2532–9. 4. Yan Yu Chan J, Bonnie NK Choy, Alex LK Ng, Jennifer WH Shum, Review on management of primary congenital glaucoma, J Curr Glaucoma Pract, 2015;9:92–9. 5. Mendicino ME, Lynch MG, Drack A, et al., Long-term surgical and visual outcomes in primary congenital glaucoma: 360 degrees trabeculotomy versus goniotomy, J AAPOS, 2000;4:205–10. 6. Abu-Hassan DW, Acott TS, Kelley MJ, The trabecular meshwork: a basic review of form and function, J Ocul Biol, 2014;2. 7. Craven ER, Katz LJ, Wells JM, Giamporcaro JE, iStent Study Group; Cataract surgery with trabecular micro-bypass stent implantation in patients with mild-to-moderate open-angle glaucoma and cataract: Two-year follow-up, J Cataract Refract Surg, 2012;38:1339–45. 8. Malvankar-Mehta MS, Iordanous Y, Chen YN, et al., iStent with phacoemulsification versus phacoemulsification alone for patients with glaucoma and cataract: a meta-analysis, PLoS ONE, 2015;10:e0131770. 9. Arriola-Villalobos P, Martinez-de-la-Casa JM, Diaz-Valle D, et al., Glaukos iStent inject® trabecular micro-bypass implantation associated with cataract surgery in patients with coexisting cataract and open-angle glaucoma or ocular hypertension: a long-term study, J Ophthalmol, 2016;1056573.Epub. 10. Minckler D, Mosaed S, Dustin L, et al. Trabectome (trabeculectomy-internal approach): additional experience and extended follow-up, Trans Am Ophthalmol Soc, 2008;106:149–60. 11. Brandão LM, Grieshaber MC, Update on Minimally Invasive Glaucoma Surgery (MIGS) and New Implants, J Ophthalmol, 2013;2013:705915. 12. Vold S, Ahmed II, Craven ER, et al., Two-year COMPASS trial results: supraciliary microstenting with phacoemulsification in patients with open-angle glaucoma and cataracts, Ophthalmology, 2016;123:2103–12. 13. Hays CL, Gulati V, Fan S, et al., Improvement in outflow facility by two novel microinvasive glaucoma surgery implants, Invest Ophthalmol Vis Sci, 2014;55:1893–900. 14. Pfeiffer N, Garcia-Feijoo J, Martinez-de-la-Casa JM, et al., A randomized trial of a Schlemm’s canal microstent with phacoemulsification for reducing intraocular pressure in openangle glaucoma, Ophthalmology, 2015;122:1283–93. 15. Seibold LK, Soohoo JR, Ammar DA, Kahook MY, Preclinical investigation of ab interno trabeculectomy using a novel dualblade device, Am J Ophthalmol, 2013;155:524–9. 16. Khaimi MA, Canaloplasty; a minimally invasive and maximally effective glaucoma treatment, Journal of Ophthalmology, 2015;Article ID 485065.